Top class exercise and indoor cycle! The Racer S offers up to 1000 Watt resistance and the console is compatible with fitness apps as well as the genius training software Kettler World Tours (included in contents) thanks to its Bluetooth receiver. 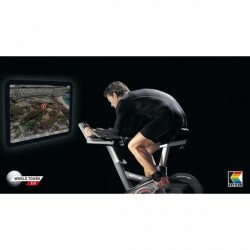 Kettler Indoor Bike Racer S: Bicycle training of the highest level! 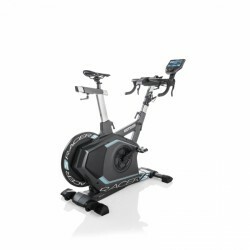 The Kettler Racer S is built like an indoor cycle and has the functions of an exercise bike thanks to the induction brake. The resistance can be precisely adjusted, independant of RPM, up to 600 Watts. Even up to 1000 Watts dependant on RPM. With a performance range from 25 to 1000 Watts the Racer S offers beginners as well as professional athletes the optimal training level. The Kettler Racer S also offers fantastic ergonomics. Through the construction of the frame as well as the adjustable saddle and handlebars users between 1.55 and 2.05m can find the perfect position, so that the training is easy-on-joints, comfortable and most important effective. Additionally to the upright sitting position is also the bent forwards racing position possible. The premium display from Kettler offers high training comfort and numerous setting posibilities. Special attention was given to making sure it stayed simple to use. Next to the classic training programs like heart rate training, the console also has special HIIT programs so that you can quickly reach your training goals with short but intensive training sessions. Thanks to the Bluetooth receiver you can connect with fitness apps as well as the Kettler apps KETTMaps and Kettler World Tours. IPN Coaching is an especially clever function in the new console: each user can do a fitness test. From this result 24 tailor-made training program are generated. These are based on scientific concepts developed by the Cologne institue for prevention and aftercare. 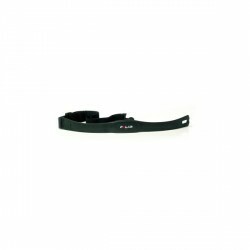 For a real cycling experience the Kettler Racer S is well designed with high quality components. For example, the Kettler Racer S has high quality shift levers. These simulate changing of the gears and makes for a close to realistic cycling experience, e.g. when you climb virtual mountains in Kettler World Tours. The power from the pedals is transferred to the flywheel mass by a long ripped belt drive. Kettler Software World Tours 2.0 In stock! Kettler Exercise Bike Racer S incl. Kettler World Tours 2.0 add to comparison list.